NatTopping.com: The Saga of the Viking Women RETURNS!! For those who visit this blog but have never given me your email, count yourselves as blessed. Because whenever I have a show that I really want to plug (meaning, of course, that I'm on the hook if we can't make rent), I send obnoxious emails to people begging them to see the show. In the interest of continued obnoxiousness, I'm going to reprint the email here. Because I would really like people to come to the show. NEW SHOW!! The Saga of the Viking Women, etc. Since you are getting an email from me, I’m sure you have already surmised that I’m about to plug something. You would be right, because guess what? Daddy has a show! I apologize if you’ve already received all of this information through having the misfortune of being my Facebook friend. As my Facebook friend, you should have realized this was coming, though. The title itself is worth the price of admission! Anyway, it’s a great show. We did a version of it at the Neo-Futurarium as part of their summer Film Fest and it went over so well we decided to remount it. I play the Great Sea Serpent, I wear a poncho, I sweat a lot, and I also sing. I’ve got the press release below and a picture of me looking like a moron, attached! I’d love to see you all come out (early and often)(wait, was that some sort of innuendo? )(well, this got awkward quick). CHICAGO, IL (September 14, 2010) ... You could call it a metatheatrical feast of love, lust, betrayal, loyalty, and the struggle of all human beings to overcome the suffering of being alive, or like the poster says, “A hilarious play based on a bad movie, with songs and scantily clad ladies, performed by lunatics.” It’s Robot vs. Dinosaur’s The Saga of the Viking Women and Their Voyage to the Waters of the Great Sea Serpent (as Performed by the Inmates of the Asylum of Charenton under the Direction of the Great Sea Serpent). The show runs Fridays and Saturdays, September 24 - October 23 at 10:30 pm at Stage 773. This comedic play reanimates Roger Corman’s 1957 babesploitation fantasy about Viking women in search of their men and mashes it together with the famous 1963 Peter Weiss play best known as Marat/Sade. The Saga of the Viking Women… will challenge all of your preconceived notions of both asylum inmates and buxom berserkers. Catch it Fridays and Saturdays, September 24 - October 23 at 10:30 pm. Stage 773 is at 1225 W. Belmont (the former Theatre Building Chicago).Tickets $15. Call 773-327-5252 or http://www.stage773.org/. More about Robot vs. Dinosaur: Robot vs. Dinosaur is a writer-centric group with a great deal of experience in the Chicago sketch comedy and improv scene. Their goal is to write and perform original comic material that is eclectic, dynamically staged and fun for audiences. Assembled by Joe Janes, the comic mind behind the 365 Sketches Project, Robot vs. Dinosaur consists of fellow writers Geoff Crump, Susie Gutowski, Rebecca Levine, Chris Othic, Nat Topping and Greg Wendling. More information can be found at http://www.rvdchicago.blogspot.com/. 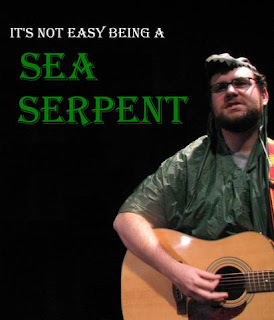 A bearded sea serpent? Something of an oxymoron, don't you think?